Don’t see the item, size or color combination quilt that your’re looking for? We specialize in custom quilts , pillows, and wall hangings made to your exact specifications. Unique, hand crafted Christmas tree skirts, quilts, pillow covers, and stockings for your home or the perfect gift for your loved ones. 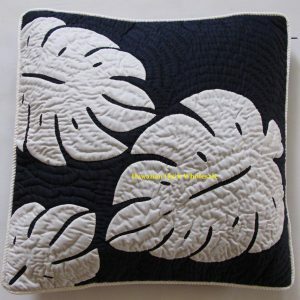 Our Hawaiian quilts are 100% hand quilted & appliqued and clearly reflects the skill and craftsmanship of our quilters. Some of our master quilters have over 50 years of experience. Each quilt can take several months to complete by hand. "My beautiful bedspread arrived to complete my home. I love the royal red color and the regal design. Thanks to Mila, she was able to have it custom made to fit my bed. What a pleasure to deal with this company! Again... salamat! Michael-Waikiki"
Our baby in NJ received your quilt. The family is just amazed at how beautiful the quilt is. They love it more than any other new baby gift that they received. You will definitely hear from us again. Just wanted to let you know how much I adore my quilt(maroon on pink sea turtles. It is lovely! Just leaving good feedback wasn't enough, I had to tell you how pleased I am. Almost makes me feel like I am back in Hawaii. I just wanted to take a minute to tell you that I love the things you make and sell. The quality is excellent and the price is great! I will continue to make purchases from your store because of the great service and how satisfied I've been with all my purchases. Thanks and have a great day! Aloha! Just wanted to let you know that I just received my Pineapple Bedspread/pillows. I immediately put it on my bed and it looks just beautiful! The dolphin wall hanging I received last week was beautiful as well. I gave it to my granddaughter and she just loves it! Look forward to doing future business with you again. Mahalo nui. Just wanted to say THANK YOU VERY MUCH for the excellent quality and beautiful Hawaiian baby quilt. I will be giving it to a very special mother-to-be for her first baby girl in a couple of months. I will definitely buy another Hawaiian quilt from you either for myself or as a gift. Thanks again. I just wanted to thank you for making it easy for me to buy the rose design quilt on Paypal and just as always, your quilts are absolutely beautiful and perfect just like the one I received yesterday. Thank you! Aloha Torres Ohana! Received my multiple purchase order and it was very beautiful. It was a special gift to a very humble friend who broke down in tears. Already the other ladies wants to order so don't be too surprise if you hear from other Albuquerque people. Until next time..... Aloha Margie & Ohana! Aloha, all the baskets arrived today in fine shape. They really are unique, and I like them very much. I am sure they will make fine gifts. Thank you for the excellent service you provided me! Best Wishes. I received the pillow covers today and am very happy with them. I appreciate your quick service, I never thought I'd get them so soon. Thanks! I just wanted to tell you we received the quilt and pillows today. They are beautiful. I really love them and it has inspired me to completely redo my bedroom. I will tell everyone who sees them where they came from and have left positive feedback at ebay. Thank you so much. I received my new quilt set yesterday, and it is just beautiful! I want to thank you for such prompt service and lovely quality. My friends will be envious, and probably be contacting you!!... Mahalo. The big quilt got here just now...it is beautiful...as are all of the things we ordered. Thank you very much! I have received my beautiful pillow covers. I LOVE THEM! I just wanted to tell you again how much I appreciated doing business with you - I am so glad to have found your store. Owning something Hawaiian-quilted brings back memories from my recent trip. I'LL BE BACK! MAHALO! The tree skirt arrived and I cannot express how very pleased we are with it. The holly design in the middle is absolutely beautiful. The hand stitching is of very fine quality. Wonderful, wonderful!! I have left positive feedback for you and would appreciate the same from you. I hope to deal with you again...perhaps a quilt to remind me of home. I received the beautiful Hawaiian baby quilt--it is perfect for my new niece! Thank you for your prompt shipping and communication! This will be the start of a new family tradition thanks to you. Thank you! Nicely made. Tiny, unobtrusive stitches in the quilt. Hand applique & quilting! Excellent service, that's why I kept coming back...thanks. Beautifully handcrafted quilts. Hey Buddy!, I found this information for you: "Home". Here is the website link: https://www.hawaiianquiltwholesale.com/. Thank you.